What is the Certified Rental Building (CRB) Program? The Certified Rental Building (CRB) program is a quality assurance and accreditation program that assists renters to identify well-managed buildings with responsible landlords. For a property to be designated as CRB certified, it must meet 50 mandatory standards of practice and be reviewed by a third party auditor, J.D. Power and Associates. These rigorous requirements address standards relating to resident management, human rights compliance, building operations, financial management and insurance, energy conservation and sustainability. Why is Hollyburn taking part in the Certified Rental Building Program? It is Hollyburn Properties’ mission to operate as an innovator and industry leader in property management and rental housing. “With 38 rental communities and 2,500 units certified in Vancouver to date, Hollyburn Properties is proud to represent the largest number of certified rental properties in British Columbia. We are excited to spearhead the CRB program with LandlordBC as it allows us to continue to set the bar for best practices in the rental housing industry.” – Allan Wasel, Hollyburn Properties General Manager. In addition, Hollyburn has 19 CRB buildings in Toronto representing over 1,100 certified rental suites. The main goal of the CRB program is to build consumer confidence and elevate operational standards in the rental housing industry. It gives renters peace of mind knowing that a CRB building represents quality, service and professionalism. CRB establishes a set of uniform standards and quality benchmarks for landlords and renters across the industry. What’s involved with putting properties through the CRB program? CRB certification involves training, education, and operations and management. The process takes an estimated 10 to 14 weeks to complete. Hollyburn Properties has involved its entire team in the CRB training and certification process. There are three training modules – Accessibility, CRB Standards of Practice and Harassment and Bullying. All buildings and administrative processes must meet the legislative requirements in that province, in addition to the 50 CRB Standards of Practice. These involve every facet of property management, including but not limited to: maintenance requests, safety and emergency preparedness procedures, insurance requirements, annual fire and elevator inspections, regular cleaning schedules, etc. Most importantly, there are administrative policies in place to ensure all processes are properly enforced, documented and followed up on. “The Province of British Columbia recognizes the importance of having a good supply of safe, reliable rental housing as well as the need for certainty for both renters and landlords alike,” said Rich Coleman, B.C. Minister of Natural Gas and Minister Responsible for Housing. 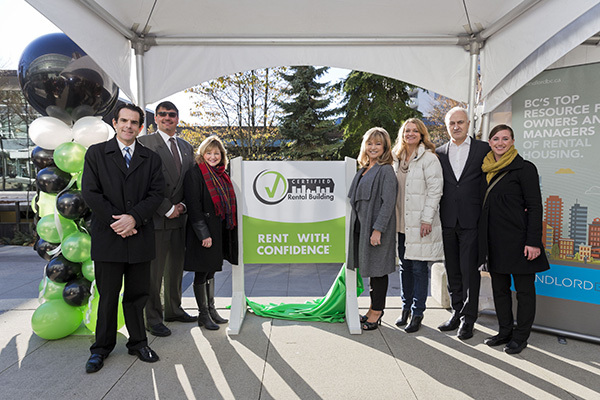 “The Certified Rental Building program is a great initiative that will help achieve these goals for all British Columbians.” Read the news release here. Renting with Hollyburn Properties means renting with confidence! For more information on CRB or current apartment availabilities, please contact [email protected] or call 604.662.7345.